Beautiful, historic hotel and superbly friendly, helpful staff. Huge rooms, incredibly high ceilings, and a gorgeous pool. 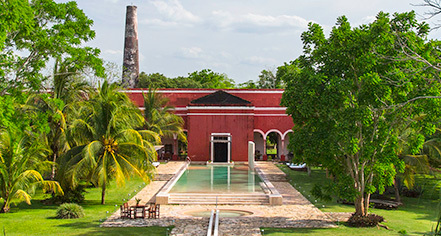 Much of the history of the estate's life as a sisal plantation/factory has been maintained. Walking the grounds is a real treat. The staff particularly Concierge Marvin Robles went out of their way to ensure our stay was top notch. We appreciate the your precious time you took to write this useful review. We are so thankful reading about your experience at Hacienda Temoz?n. The property is a magical place with beautiful gardens to enjoy of nature and our Team is truly genuine people. Please do not hesitate in contacting us directly for your next visit or visiting Thaciendas.com. It was a honor having you as a guest. We had a great stay at the Hacienda Temozon, driven by exceptional service and hospitality in a very traditional setting. It started with our late evening arrival, where we were greeted with a complimentary light meal, fruit and snacks. Throughout the stay we were looked after with tremendous service and friendliness, almost as if we were guests in a house. The property is beautiful, with the grandeur of this former centuries old hacienda balanced with a weathering of the property which gives it a rustic charm. The room we were in was massive, with high ceilings, comfortable beds, a large bathroom, and a terrace area. As a rustic property , not everything was in perfect working order, but it did not matter to us- given the surroundings. Daily breakfast was nice, with a multi course breakfast available with choice of main cooked to order, as well as a la carte options for Mexican and Western dishes- recommended are the chilaquiles and the quesadillas. Dinner was also excellent with local Yucatecan specialties such as cochinita pibil, panuchos, poc chuc and other options. And again, as mentioned, service was tremendously friendly , from reception to the restaurant to the valet and bell service. Location is great, south of Merida but closer to the sites of Uxmal , Kabah and Labna, as well as some local cenotes and Haciendas. Just a 5 min drive from the main road between Merida and Uxmal through villages. Worth a stay here- very special location and wonderful staff. Thank you very much for your detailed review of Hacienda Temozon. We really apreciate you time and valuable feedback. Your insights about our food are just amazing and make us so proud of our Team!! Thank you again for taking the time to let us know about what you experienced here. Platinum Review - Nice, but Issues! Marriott Platinum Recognition- We were upgraded to a large suite and outdoor pool/tub. We were given a bottle of wine and bowl of fruit as a special welcome gift. We selected the breakfast as our platinum amenity, which consisted of coffee, juice, fruit, breads, and eggs. Overall, very good recognition. Room - Our suite was very large with a combination living room/bedroom. The bathroom was large with a single sink, separate area shower, double closet, and separate toilet area. There was a back door that accessed the small patio and outdoor tub. Unfortunately, the patio and outdoor tub area was not private. Overall, the room was very nice! Resort Fee - There was NO resort fee. Yay! Customer Service- The customer service received during our stay was mixed. Many servers stood around without paying attention to basic needs. However, we received excellent services from Nelson. He was the bright light of our stay. There was complimentary valet parking and the attendants were always polite and responsive. Maid service was impeccable. The overall service was good. Property - Hacienda Temoz?n was once a grand home of the owners of a sisal plantation. It was beautifully converted into a luxury hotel, unfortunately it had not been well maintained. Bushes have not been trimmed, yard waste has not been picked up, and pool lounges/umbrellas are older and some broken. The Spa Cave was not inviting. On a positive note, the pool was large and a beautiful focal point of the hotel (but was cold). Overall, Hacienda Temoz?n is a nice boutique hotel. However, it does not compare to the beautiful Uayamon and Santa Rosa Marriott Haciendas. We marginally recommend staying here. We would like to thank you very much for taking the time to review our property on Trip Advisor and for having chosen Hacienda Temozon for your most recent visit to the Yucatan Peninsula. Your constructive feedback is definitely welcome as it is one of our most powerful tools to promote a culture of permanent improvement. Your comments have been shared with the management team and will be taken into consideration in the preparation of our action plans. We would like to extend an open invitation for you to come back to any of our 5 Haciendas in the very near future. 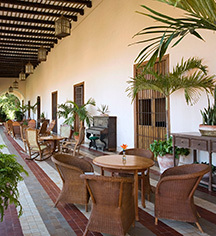 This hacienda is a true gem, the buildings are exquisite (350 years old) and beautifully restored. Decoration in common and outside areas could not be more elegant. We stayed in a junior suite, very tastefully decorated and large with an equality elegant and stylish bathroom. Lots of thoughtful, lovely details such as fresh flowers changed daily and placed on top of the bed and in the bathroom area. The staff are lovely, sweet and very helpful, nothing is too much trouble to make sure guests are happy! There is a beautiful restaurant on site overlooking the pool which offers a really good choice of local dishes and more. There is also a SPA. It has been a pleasure having you at the Hacienda Temoz?n. Your honest feedback made us feel really proud of our Team and property. Driving directions tend to be difficult, specially when you do not know the region. Thank you for taking the time to let us know more about your experience. 1) You should pick up some snacks in Merida or the little town outside the gates has coke and cookies and chips. Your out in the middle of nowhere which is part of the appeal. 2) Waze works very good, so if you rent a car its easy but the price they quote you in the USA is usually higher at the rental car place (not on site). 3) Food is reasonable and room service was good. 5) Service at the pool was very slow, they needed more help out there. 6) Pool is not heated so its not real warm in the winter months. 7) The massage pricing was to high, never saw anyone get a massage. I think about $120 for an hour. For this location/place its about twice as high as it should be. 8) Uxmal ruins were nice (about 30 minutes away) and some of the local cenotes were good. - Check out Yax Bacaltun (old school not to crowded) and the other more touristy one nearby (you need a reservation) is Cenote Mucuyche. I would skip Cuzama cenotes - far and a lot of tour buses. Thank you very much for giving a full description and review of Hacienda Temozon on Trip Advisor. We value your feedback highly. We are so happy to know that you spent such a lovely time here!! Thank you very much for your time and attention and we look forward to welcoming you back in the near future at any of oour 5 Haciendas..